I definitely did not anticipate some of my classmates’ answers to this question in my class on race and ethnicity in the Americas in Chile. Thirty percent! Fifty percent! (What?) My reaction was immediately to jump in and assert that the black population was actually only thirteen-percent. Furthermore, as a North-American international student, especially as someone who identified as a member of the population in question, I felt as if I had to set the record straight in that moment. Back at home in the United States, I would never have doubted my capacity to engage in conversations about race, ethnicity, and identity. But this was Latin America. I really wanted to say something after hearing some wild percentages thrown out by some of my Chilean classmates. However, I remembered that I was on a different continent. I would be participating in an intellectual conversation about race and ethnicity in a completely different national, historical, social, and academic context. I was simply more familiar with race relations in North America by virtue of my life experience and nationality. More importantly, the biggest internal barrier from participating that day was the challenge of expressing myself intellectually in my second language. Not only did I have to express my views about race in front of other students during the first week of classes, but I also had to do so in a language that I had not yet mastered. This was a multifaceted challenge. Nonetheless, something pushed me to raise my hand anyway and from the way my professor’s eyes widened, I could tell he had been impressed that an international student wanted to participate in the discussion. I stated that African-Americans actually only make up twelve or thirteen-percent of the U.S. population, but American media and domestic political issues that circulate around the globe could easily give the impression to foreign societies of an African-descendent population in the United States much larger than the reality (not to mention the notable role that African-Americans have played in the development of the U.S. from slavery to the present). Sometimes you have to take risks to fully take advantage of an experience. That day, I was able to express myself clearly in Spanish, even though I’m sure everyone in the room recognized I was North American by my accent. Regardless, the important thing is that I mustered up the courage and confidence to participate in the class. What’s most important about learning a language is developing the confidence to communicate in an unfamiliar language and environment. You have to learn to be comfortable with discomfort. Of course, as a Black-American student abroad, it’s quite enlightening to have a course about race and ethnicity in Latin America. During my time here, I have no doubt that it will provide a continual source of critical and constructive reflection about my personal experiences abroad. I’m training myself to think about my identity in a global context and appreciate how different countries can interpret and define social identities differently. Furthermore, considering the salience of movements for indigenous peoples’ rights in Chile, I’ve been able to stretch my own reflections about race and identity beyond conversations about black identity. Still, it’s easy to feel uncomfortable as someone of African descent in Chile. When I sit to eat lunch in the university cafeteria, I can’t help but feel slightly out of place as I look around and see a sea of phenotypically homogenous Chilean faces around me. At times, I feel separated from the rest of the students twice over for both my phenotype and my nationality.It’s always a tough balancing act to gauge how much you should reflect on your own identity. But my challenge this semester in Santiago will be to push myself to just enjoy the opportunity to study abroad without overthinking the role my identity plays in daily life in Chile and letting that determine how I feel here. Moreover, I have to think about how other study abroad students might be struggling with cultural shock in similar or different ways. In my blog, I’ve been addressing my feelings on being a black man in Chile, but I want to also emphasize the importance of thinking intersectionally about our identities while we travel abroad. Indeed, I face the challenge of being a black man in a Latin American country without a recognizable black presence. Yet, what about black women studying or traveling abroad? Until I talked with women in my study abroad program, I didn’t realize how serious of an issue catcalling had been for them when just walking on the street and the discomfort it can often produce. Even as I adjust to new understandings of race and ethnicity, I have the privilege of not having to worry about my safety in the same way women studying abroad might. Besides, as I think beyond identity, I’ve begun to realize that my issues with adjustment have less to do with demographics and everything to do with physical geography and academics. Diego Portales is an urban university in the heart of Santiago, while Amherst College, my university in the States, is a liberal arts institution in rural Massachusetts. At Amherst, I was used to attending classes with familiar faces, dining with my classmates in the college’s sole shared dining hall, and only having to walk ten minutes or less to visit a friend on campus. At my Chilean university, on the other hand, there are no on-campus residential dormitories. And more importantly, there is no “campus” since the buildings are scattered in the same area of the city! The students here in Santiago go to classes…and then go home to apartments in the city. In addition to the urban culture of the university, students at the University of Diego Portales seem to become really close with other students in their career track (“carreras”) since they take classes with the same group of students from the beginning. On the other hand, in American universities, its my impression that students tend to have many friends outside of their major. Considering this university structure, I’m learning that I will need to be quite pro-active as an international student to get to know my Chilean classmates better. 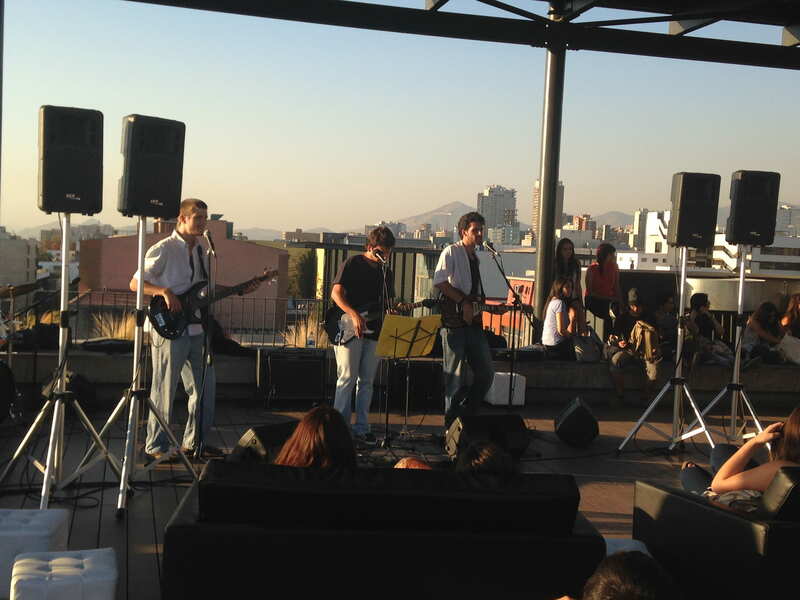 Student band performing on the rooftop. It was awesome to see the Santiago skyline while during the concert! My first pro-active step was signing up to be a English-language conversation leader for Chilean students who want to improve their foreign language skills. Once that gets underway in April, I’ll definitely make sure to blog about it. I think it will be an effective way to connect with Chilean students outside the classroom and perhaps make a few new friends. Chilean friends will come when they come, but in the meantime, it’s been really great to experience the university culture here in Santiago with other students from my program. The first week of classes, we went to an incredible welcome event for new students with free food and student band performances. It was super bacán*! 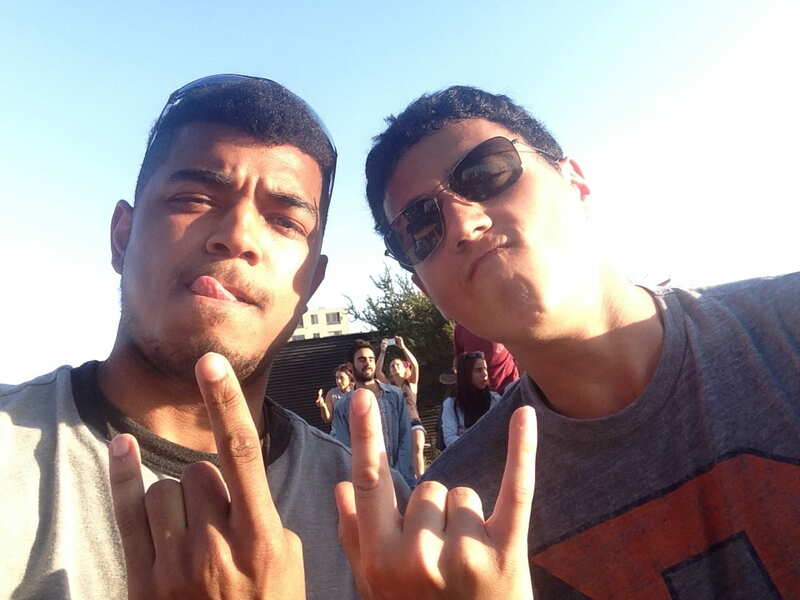 Rocking out with a friend during a student band performance. Clearly, as you can tell, I’ve been going through quite a bit of cultural shock here in Chile. Recently, therefore, I’ve made it my objective for the rest of my time here in Santiago to continually work to reimagine my challenges as new opportunities for self-growth. And in case you were wondering, I decided to follow through with my research project on Haitian immigration in Chile that I mentioned in my last post. As I learn more about immigration in Chile, I’m realizing that I’m in quite a privileged position as a study abroad student. 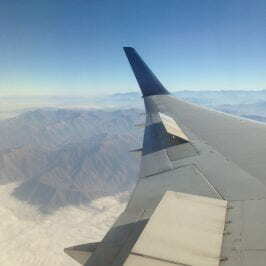 I’ve been able to recognize that my experience in Chile is transitory. For many other people in this city, cultural adjustment to life in Santiago is even more critical since they don’t have a ticket back to fly back to their home country this summer. Unlike study abroad students who always know that they will one day return back to the familiar, many immigrants here in Santiago have to try to make Chile into a new home for themselves. Their discomfort and homesickness could last a lifetime. 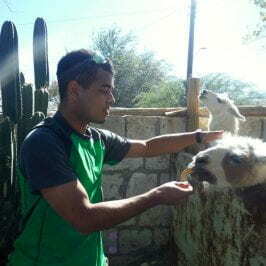 An international student studying abroad for a semester has the privilege of engaging in cross-cultural experiences without the challenge of having to adjust to living and working in a foreign country. I’m saying this not to belittle or deny the difficulty of cultural adjustment for study abroad students like myself, but to emphasize that for us, the cultural shock is temporary. This past Saturday, my study abroad program organized a day trip to the coastal cities of Valparaíso and Viña Del Mar. Although I had already visited the cities with some friends in February, it was nice to have a guided walking tour of the urban culture and history of the “porteños” (how Chileans refer to those living on the coast). Being on the coast definitely reminded me of being back home in Baltimore again. 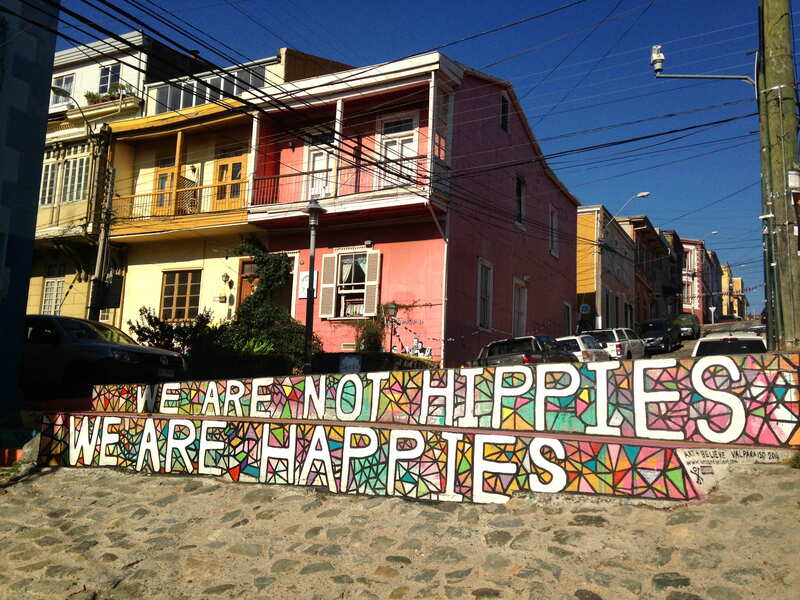 One work of public art really struck me: a radiant English-language reminder on the importance of happiness (“We are not Hippies. We are Happies.”). You can make your own conclusions about its possible significance. 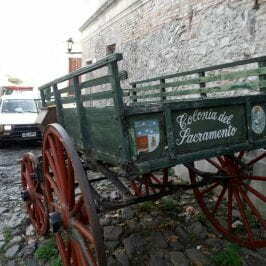 Perhaps, it has something to do with the nature of the people of Valparaíso. 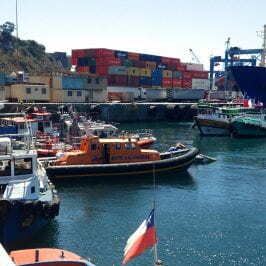 During my tour, I learned that Valparaíso has much less financial wealth than other Chilean cities. There are very few wealthy people in the city, with an overwhelming majority of people being working or middle class. I can only speculate that perhaps the creators of this work of art wanted to let people know that Valparaiso is rich in happiness and culture, if not financial wealth. The words propelled me to just appreciate the wonder and beauty of being alive, of simply having the chance to study abroad. After seeing that mosaic in Valparaíso this weekend, I decided that I really want happiness to be my prime objective here in Chile. I can’t deny that issues of identity have been (and will continue to be) a really critical part of my study abroad experience. I can’t deny that I will continue to face challenges here in Chile for a variety of reasons, but at the end of the day, there is still so much I can find to be thankful for with this study abroad experience. And the personal challenges I’ve faced adjusting to life here have only made me a stronger person. 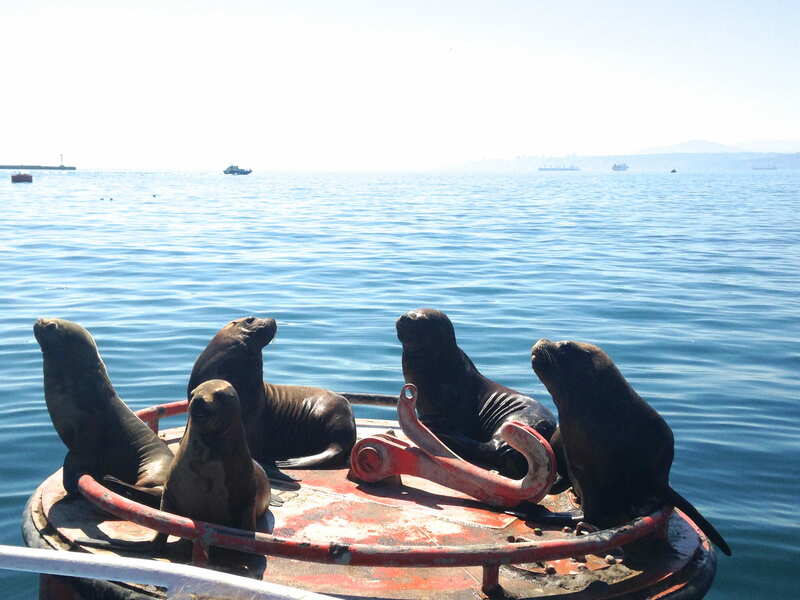 Sea lions that I got to meet while on a boat ride in the harbor of Valparaíso!